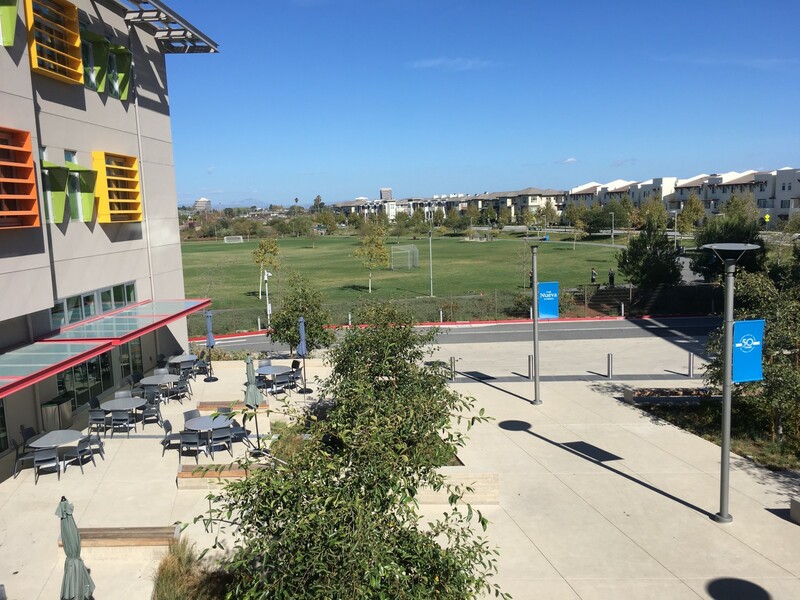 Over the last 10 days I’ve been exploring place based innovation ecosystems around the Bay Area in California, and their effect on school cultures and practices — particularly how the tech industry and mindsets are influencing school design and pedagogy, and school level innovation. There are a number of key ingredients at system level which prove to be powerful drivers of innovation — the culture and values of the Bay area play a huge enabling role, for example the more liberal political culture (on the US political spectrum) and a strong entrepreneurial and business orientated psyche which leads to a climate of experimentation, risk taking, doing and innovating, and connecting. The proximity of different organisations and ‘actors’ — education, business, analysts, VCs etc — and the opportunity for interactions to take place is also important (with any ecosystem) facilitated by infrastructure, transport and digital connectivity. The lovely weather is also no doubt a factor in attracting people to live in the Bay Area, as well as a City which is a highly diverse high energy melting pot for those who fancy an exciting and challenging lifestyle. Tech is clearly an intrinsic part of the ecosystem landscape at every level, in part driven by the sheer number of people who live in the Bay Area and work in the sector — it’s almost impossible to have conversations when out and about with people who don’t have some connection to Silicon Valley either directly or through friends/relatives. 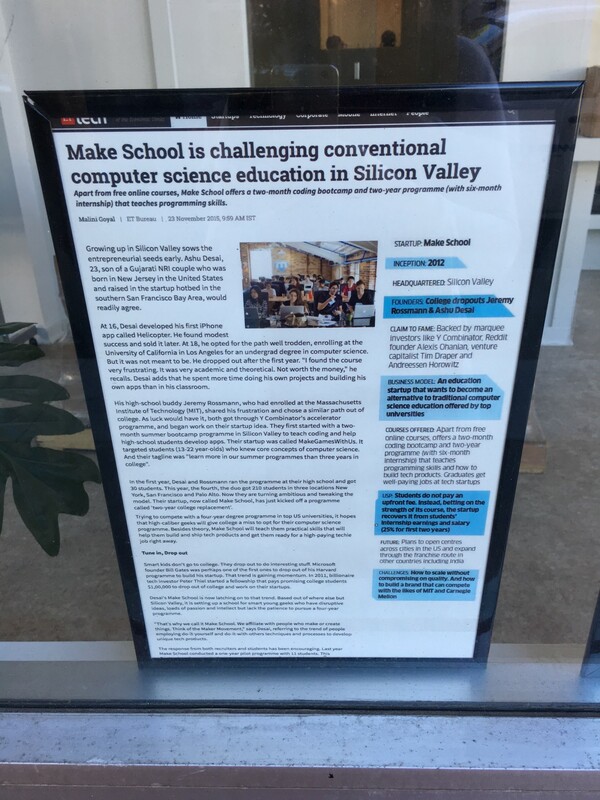 One knock on effect of this, which Ariel Raz at the Stanford d.school explained to me, is that there is apparently a much higher rate of adoption of tech products and tools across the general population in the Bay Area, and by extension, within schools. And linking to the wider innovation culture, teachers and school leaders are more inclined to experiment, particularly if supported by parents who share the same mentality. Catalysts within the ecosystem (which I discuss later on) play an important role in connecting industry and entrepreneurs with educators and schools, enabled by opportunity and proximity factors. Hence why many of the innovation trends I’ve been hearing about on this journey so far (which invariably involve a tech or digital component) are originating from the Bay Area. It will be interesting to see over time which of these trends and tools have the most impact at both system and school level. And how close any or all will come to fundamentally disrupting the nature of school and education design and delivery. As I discussed with Tom Arnett from the Christensen Institute, the application of new technologies is often just as important to disruption as the technology itself. And I was reminded of that quote about how we tend to overestimate the effect of a technology in the short term, and underestimate the effect in the long term. It also got me thinking about the wider network of VCs, Foundations, and incubators which are all supporting EdTech innovation, and whether their funding regimes could be a barrier to the transformative potential of tech tools — assuming we think that tech is going to be a powerful disruptor and innovation diffuser. 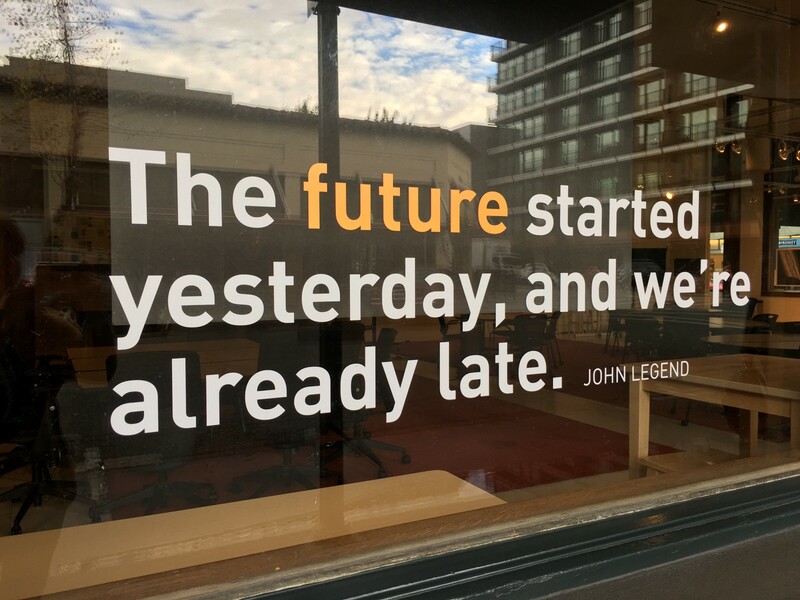 For example a desire to see a rapid ROI within a short timescale leads to companies/entrepreneurs often just designing better and more efficient ways to do traditional things, the easier approach to innovation, rather than radically transforming anything. So what do these wider system drivers and trends mean at a school level? 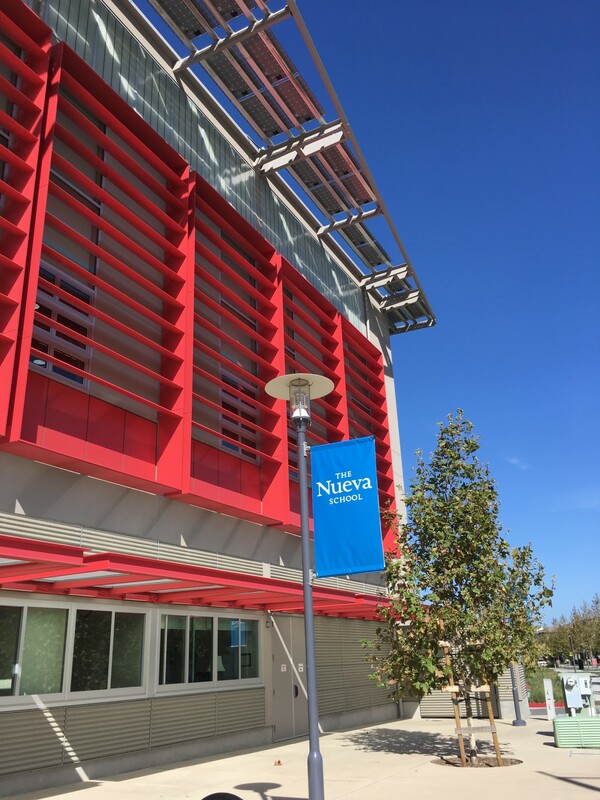 I had been particularly keen to learn about the iLAB at Nueva School, managed and overseen by Director Kim Saxe, and it’s role in school and community level innovation around pedagogy and school design practices. Within the school building the iLab is a large physical space, centrally located with outside access also, and housing a wide range of machinery and equipment. 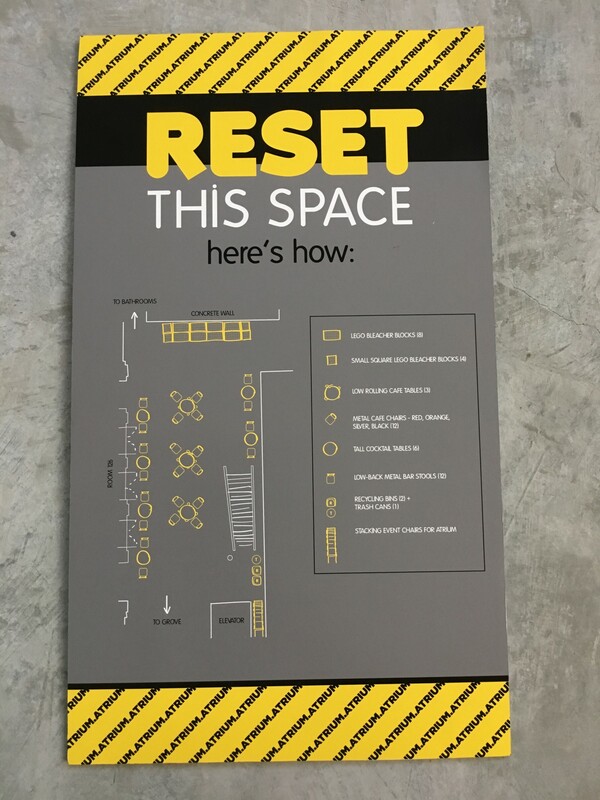 An extremely high end maker space, blending physical and digital tools, e.g. robotics, welders, laser cutters, power tools, woodwork equipment. The lab had also just acquired 15 HTC Vive’s as they start exploring VR. The iLab runs a number of programmes linked to the wider design thinking pedagogy across the school, for example Quest and Internship, and also serves as a drop in space for students who want to make stuff and set up new projects. 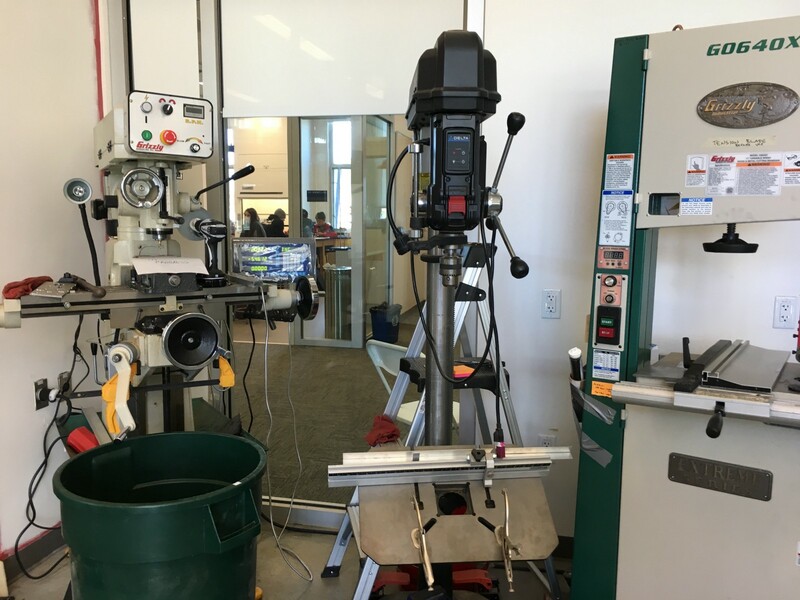 Depending on the year group, students can spend up to 3x70 min periods a week in the iLab, also dependent on the other electives they choose. It’s accessible before and after normal school hours, and in addition to Kim, there are 2 cross disciplinary teachers also working in the space. as a space for cross curricular project development around STEM and STEAM, with teachers and students able to use the space to work on projects collaboratively at any time. And with a particular emphasis on Computer Science, Robotics and Entrepreneurship. Teachers from other faculties are encouraged to work with iLAB staff. As the iLAB Director, Kim plays a seminal role as both the ‘Culture Keeper’, as she described to me, and in evolving practice between Nueva, the d.school and other schools and organisations. The critical link in sourcing opportunities, developing relationships with other organisations, and visioning of the growth of the iLAB programmes. 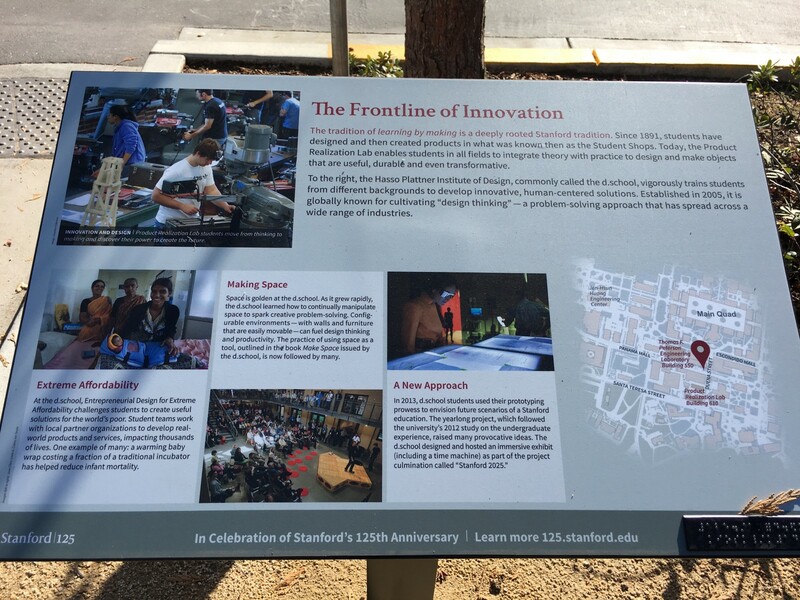 Having visited the Stanford d.school the previous day it was interesting to see the similarities between the two ‘labs/hubs/spaces’ — particularly in cultivating innovation cultures. The d.school, which is housed in its own building on the Stanford University campus, is a slightly less ‘high tech’ maker space (more about pens and post its), but serves a similar function in bringing students from across academic disciplines at the University together to work on design thinking projects, acting as a catalyst for spreading and diffusing design thinking practice across the University. 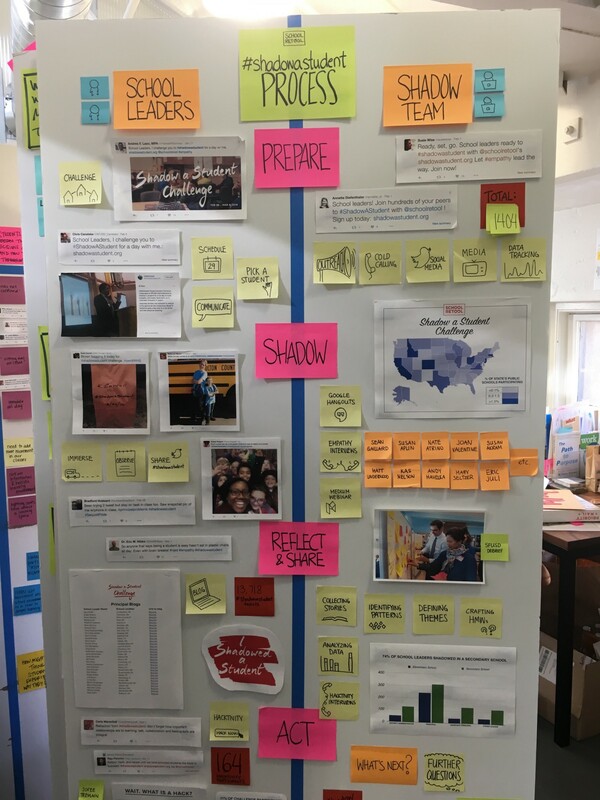 In addition, through their K12 Lab programme and School Retool, the d.school works with school leaders, educators and school districts across the US to develop design thinking practice in schools — a cross campus and cross community role — and the d.school is also cross disciplinary in terms of its staffing team. In fact, thinking about the two ‘labs/maker spaces’, they provide an interesting case study for how higher education initiatives, tools and spaces can translate into different arenas of education e.g. secondary schools. From spending time in the Bay Area I can see why design thinking is such a potent pedagogy in this part of the world, as it’s so closely linked to the wider systems and processes in the start up and tech industry — UX, prototyping, product development, user testing, evaluation, scaling. (And these design processes and mindsets are also translating to the school design and start up school world, thinking about the role and structure of catalysts). Across the US design thinking is spreading in interest and application, and pretty much everyone I have spoken to so far (in Seattle and California at least) have talked about it as a core competency, similar to communication, critical thinking, emotional intelligence, grit etc. And I’m now starting to hear some educators in the UK also taking an interest. 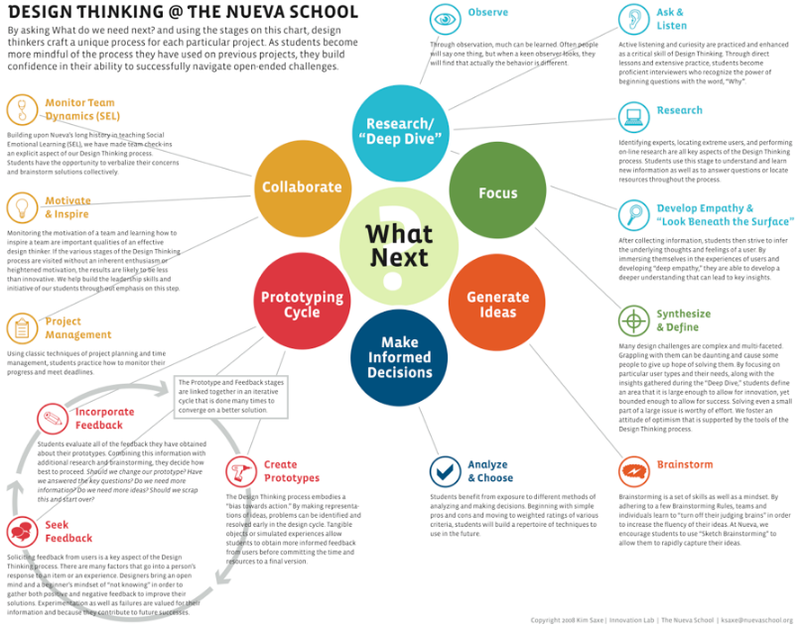 At a student level (at Nueva) the pedagogy proves to be an important influencer and enabler of doing, making, collaborating, pro-activity, self directed learning, connecting, experimenting and risk taking. And as mentioned above, this is often reinforced by parents, relatives and friends — or perhaps actually this is where it all starts, home cultures — as many work in the tech or design sector in the Bay Area. The language of start ups, tech, creativity and entrepreneurship infuse the dynamics of the locality — young people see ‘cool’ stuff happening on their doorstep and are able to experience it directly. It was no surprise to learn for example that Ashu, co-founder of Make School, had previously been a student a Nueva School. 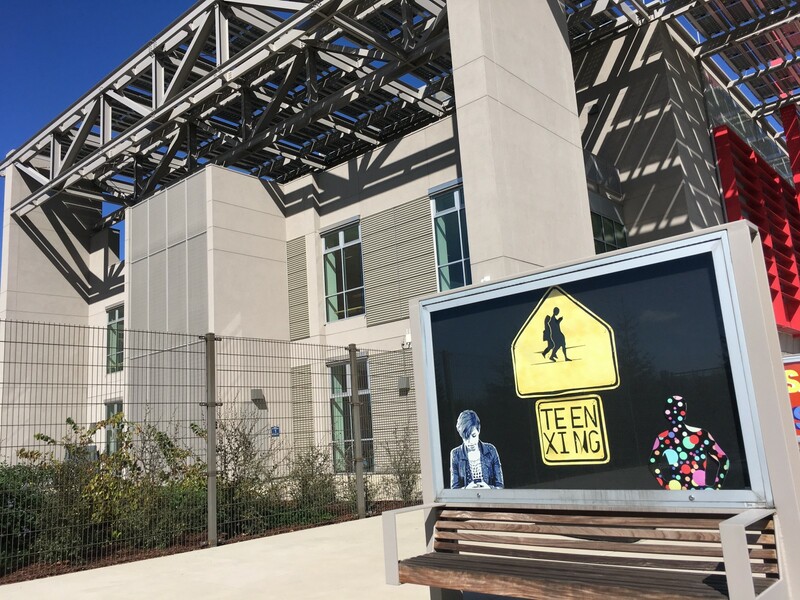 Empathy is an interesting concept in education, from the design thinking perspective, and I also spent a morning at the Virtual Human Interaction Lab at Stanford University learning about their work in analysing people’s social and emotional reactions to VR experiences, and longer term effects on behaviour and potential changes to behaviour patterns. Simulated worlds are designed to provoke an emotional reaction, or trigger an emotional response, and you could certainly see the potential for say the treatment of phobias, and introducing challenging situations to allow familiarisation and adjustment. One particularly powerful simulation looked to tackle issues around gender and race discrimination, where the user, wearing a VR headset, is initially conditioned to feel like a person from a different ethnicity or gender, then has to navigate an encounter where they experience abuse or discrimination or stereotyping. Almost literally putting yourself in someone else’s shoes — which is how Ariel described their starting point for school and curriculum design at the d.school. I’m very much at the beginning of the journey in terms of looking at the role and function of catalysts and accelerators/incubators in US ed innovation ecosystems, but I had the opportunity to meet with the New Schools Venture Fund, one of the more established catalysts set up in 1998 by three social entrepreneurs and VCs, and Digital Promise, which was launched in 2011 by President Obama as the National Center for Research in Advanced Information and Digital Technologies. NewSchools describe themselves as a second stage catalyst, working across new school design and set up, leadership development, and the development of new innovation tools and services for schools, framed around challenges which are co-designed with educators — and with some proof of concept required to access their programmes. Identifying and developing education entrepreneurs is an important objective for them, and it was great to gain a deeper understanding of the range of different catalysts within and across the system, working at different levels, which I hadn’t appreciated previously. Digital Promise is a similar actor in this space but primarily a network and movement builder, coming in at something of a middle level and working with school district Superintendents and existing district schools to build innovation communities. Their role is much more focussed on convening and facilitation, building clusters (regionally) and communities of practice — a system glue. And developing something of a ‘lab’ network of schools to trial and test new ideas and innovations. Both organisations are shifting and evolving the power dynamics across the system in their own way, and enabling the expression and growth of autonomy at a school and individual level. One of the main differentiators (other than ‘client’ group — new v existing schools) however seemed to be around the speed of change. With Digital Promise, the network building approach is likely to mean that change is potentially much more incremental and over the longer term, perhaps with less clear or certain immediate effects or outcomes, however with the advantage of having the potential for greater scalability and diffusion. A process of ‘school improvement’ almost but towards new and disruptive approaches. NewSchools on the other hand is injecting innovation capacity into the system with immediate effect — e.g. through establishing new schools, or targeted leadership programmes for people of colour. NewSchools also works around existing school redesign through leadership coaching — which is a particularly interesting challenge in the UK also. Well, right now it’s a virtually non existent conversation, other than towards improving Ofsted or exam/P8 outcomes taking very much a no excuses and highly controlled approach. It’s something that needs to be cracked (or re-messaged?) if more widespread system change is ever going to happen, and I’m keen to keep an eye on the outcomes and learning from both of their programmes over time.